St. John's has a lot of folk names .. krevník, krevníček, děravec, čarovník, St. John's herb, spice locust, dřezalka, prostřelenec, the cross, the blood of St. John .. but even more healing effects ..
St. John's wort is a very important herb with a strong folk healing effect on our bodies. Its healing effects have been known for many generations and are still under examination, because the effects of substances contained by and their combinations in this plant is not yet fully revealed. Looking at the list of St. John's against the light, we see in their sruktuře tiny red dots - red pigment glands containing hypericin, also called blood of St. John (hence one of the popular names of St. John's). St. John's Wort herb is beautiful to look at, her bright yellow flowers adorn hillsides and meadows late summer .. as if called for noticing ..
You may have noticed that St. John's wort is often part of a mixture of herbal teas against the above-mentioned unpleasant states of our mind and body - tranquilizing and sedative effects of St. John's is certainly one of its most beneficial effects on the human organism. Tea St. John's is recommended for insomnia, difficulty falling asleep, when feelings of anxiety, excessive melancholy, "hang Mind", excessive stress, gastric neurosis and even easier to treat depression. Some of us suffer from depressive states of light especially now in winter. They are mainly caused by lack of light and sunshine. They can be seen as a long-term depressed, dloutrvajici "gratuitously" bad mood and overall feeling of fatigue, loss of motivation, etc. In this type of depression is St. John's lighter often proved to be a great help. In the period of menopause in women can sometimes in consultation with an expert to replace some drugs to stabilize symptoms of hormonal fluctuations, or treatment completed. To achieve the effect of these effects is needed soothing St. John's used regularly for an extended period, the effects are usually manifested after 2-3 weeks of use. Some substances contained in třezalce affects our body as a diuretic - diuretic - thus helping with the cleaning of the body and also has a beneficial effect on the kidneys when they clean and inflammatory diseases. St. John's is a good complement to treatments for diseases of the digestive tract, such as stomach ulcers and inflammatory bowel disease. Also supports the overall activity of the stomach, gallbladder and liver. It is also considered a natural antibiotic, helps fight against pathogens such as influenza. 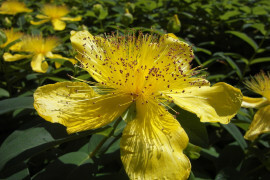 Medicinal effects of St. John's wort can also be used for external application. For this purpose, the most widely used St. John's oil. The main effects in this case are promoting and accelerating wound healing and pain relief. St. John's Oil is particularly recommended for lubrication as rheumatism, luxation, sprains, bruises and swelling caused by crushing or tapping, which is applied in the form of tiles. Anointing him with minor skin injuries and burns, but is also suitable for insect bites and stings, which reduces unpleasant swelling and itching. Some sources suggest that higher doses of St. John's wort may cause failure of oral contraceptives. It is far from the rule and a common side effect, but the user should be careful to use it in lower doses or at all. Known is the incidence of skin sensitivity to light (fotodermatitis) in some long-term users of St. John's wort. This is manifested by redness uneven skin - spots - after prolonged exposure to the sun. At the time of application of St. John's, it is better to avoid prolonged stays in direct sunlight, or prefer to use this herb in winter.